Learn Spanish in Alicante at our partner Spanish school, Colegio Internacional Alicante. Located in the heart of Alicante, the school is situated within 5 minutes walk from the sea and the Esplanada and within walking distance of the bus station. Colegio Internacional Alicante was founded by a group of professional language teachers, who are all very friendly and experienced. The school has an atmosphere that is both professional and relaxed, making learning easy and a perfect place to learn Spanish in Alicante. The intensive course in Alicante will ensure the most development in the shortest amount of time. This is a general Spanish course consisting of 15, 20 or 25 lessons per week, with each lesson lasting for 50 minutes. The intensive Spanish course is available all year round and consists of 6 language levels following the "European frame of reference". The minimum age to take the course is 17 and the minimum duration is 2 weeks. Four Spanish language levels (A1, A2, B1, B2) are guaranteed, even if there is only one student. During the intensive 25 course, you will have 5 extra conversation lessons on topics such as history, literature, art, economics, etc. Double room can only be booked by 2 persons travelling together. The supplement for full board in a double room is € 14 per person per week. The price stated here is for an airport transfer on arrival on Saturdays or Sundays between 7.00 and 23.00 in Alicante. The cost for teaching material which will be included on your invoice (€ 35) refers to a period of approx. 4 weeks; all further course materials (when students switch level or after approx. 4 weeks) need to be paid directly to the school. In 2019 the school will be closed on: 01/01/2019 - 06/01/2019, 19/03/2019, 19/04/2019, 22/04/2019, 01/05/2019, 24/06/2019, 15/08/2019, 09/10/2019, 01/11/2019, 06/12/2019, 23/12/2019 to 31/12/2019. Missed lessons due to bank holidays will not be refunded or rescheduled. If you had enough of the cold and dark autumn and winter days, it might be a good idea to go and enjoy the mild climate of Alicante and additionally learn Spanish and undertake various other activities. You can do this in a specially designed course for 50 + students in an international group. Besides learning Spanish, the course includes visits to museums and guided excursions to the ancient Roman village Lucentum and the castle of Santa Barbara. Very varied and instructive!This Golden Age course is not suitable for complete beginners and very advanced students. The language school in Alicante offers the possibility to book a dance course in addition to the Spanish language course. During a period of 2 weeks, professional dance teachers will teach you various Latin American dance styles. You will have 5 dance lessons per week in a group. The One-to-One course in Alicante is a great way for the student to develop their Spanish language ability in a short space of time. The course is based upon the student's linguistic skills and is adapted to suit their Spanish language needs. Interaction is one of the most important features in learning a language and this course is a great way of improving these skills. You will receive 20 private lessons per week. The One-to-One course is available all year round. Whilst learning Spanish in Alicante, you can choose to stay in a shared apartment with either Spanish people or up to 5 other students from the language school. The apartments are comfortable, but furnished simply. The students are responsible for keeping the apartment clean. Living in a shared apartment is an ideal option if you would like to live in an international or Spanish environment. Towels are not provided. 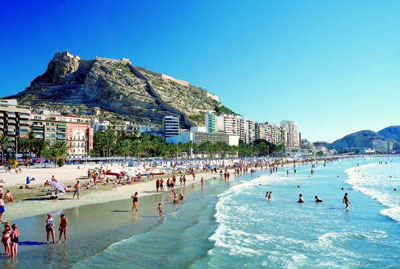 Stay with a Spanish host family whilst you learn Spanish in Alicante. Choosing host family accommodation will allow you to participate in the everyday life of a family and learn more about typical Spanish lifestyle and customs. Host family accommodation in Alicante includes breakfast, an evening meal and laundry.